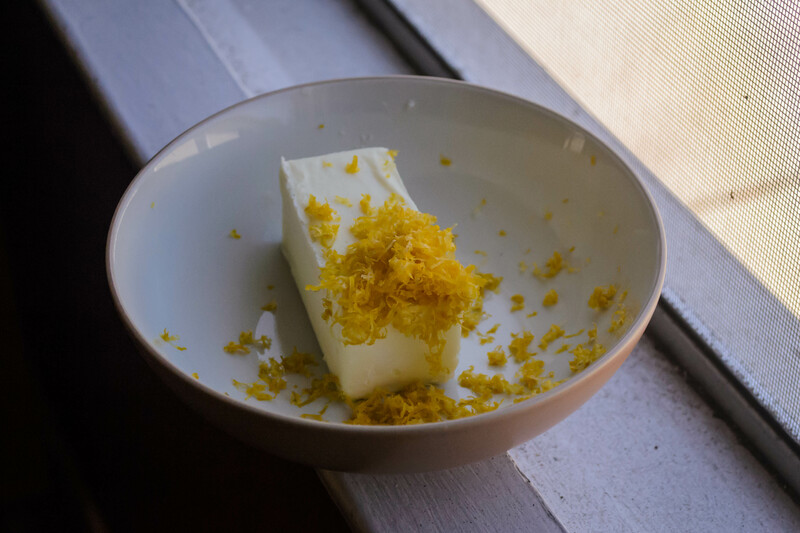 butter | "blackberry-eating in late September"
I’ve tried to start this post three or four times now. The first time I tried to skirt the events of the last week entirely, but that felt like lying. The second time I was overtly political, explaining exactly how I felt and why. That felt more honest, but it didn’t feel like the right move. The third time I tried to be conciliatory, citing concerns on both sides. In the face of change, particularly because it is not the sort of change I agree with or was hoping for, I retreated to comfort. I know this is not particularly useful. I know I am reasonably safe for a number of reasons, and closing the blinds and wallowing is not helping the people who are – or soon may be – not so safe, but I did it anyway. Finally, I decided I need more time to process what I want to say, so I’ll offer this instead, as unhelpful and uninspiring as it might be: this week was rough. Let’s have cake. For me, the deepest and firmest food comfort is baking. It makes me think of being a child, it makes me think of warmth and sweetness; it makes me feel sound. In his examination of sugar and its coming to and impacts on Europe, particularly England, Sidney W. Mintz suggests that perhaps the reason we are so attracted to sugar, especially when we are young, is because human breast milk is sweet. So it makes sense that when we are troubled, or we feel that we need safety and security, we turn to sweet foods. The original inspiration for this cake came from Starbucks. A few years ago as part of their fall line-up of baked goods, Starbucks rolled out a brown butter pound cake spiked with Washington apples, and after sampling the dense crumb and the wet, almost too sweet apple chunks, I wanted to do my own version. For the base recipe, I went with that great baking bible Baking Illustrated, by the same cooks and recipe testers as Cooks Illustrated. Their pound cake uses cake flour for a tight but tender crumb, plenty of butter, and the richness and color and emulsifying power of extra egg yolks, rather than all whole eggs. Mine adds the extra step of browning the butter first (which then necessitates refrigerating it back into solidity before creaming it with the sugar), and a generous two cups of apple cubes – granny smith, for the tartness and minimal juice expelled during baking. Most pound cakes have a soft top that splits as it bakes, and this one did offer that classic cleaving in the center, but the rest of the top – the browned exterior on either side of that tender split, was crisp and delicate and almost wafer-like – think of the top shiny, flaky layer of an excellent pan of brownies – perhaps because I was so enthusiastic in creaming the butter and sugar and then beating in the eggs. My batter looked like a good fluffy buttercream in its initial stages. I usually bring my baked offerings to work with me, leaving only a serving or two to enjoy at home, and this was no exception, but we were sorry about that. Especially as the week wore on, we wanted more of this comforting, moist-but sturdy, not-too-sweet confection, preferably in thick slices. But alas, it lasted only a few hours in our mailroom. It’s funny in that uncomfortable way, but the last time I made a pound cake was also a heavy time. It’s an uncomfortable metaphor – perhaps I should start perfecting an angel-food cake recipe instead – but hindsight is what it is, and here we are. Cake. First, brown the butter. In a small saucepan, preferably with a light colored bottom so you can see what is happening, melt the butter over medium heat. As it melts, it will foam up. Keep swirling and checking the color underneath that foam; it will gradually darken from yellow to golden, and the foam will recede a bit. Watch very closely at this point, occasionally tipping the pot to see the bottom – little white solids will have collected. When these begin to turn brown, the butter will smell toasted and nutty. Take it off the stove and stow it in the refrigerator until it has solidified but is not too hard – your thumb should still press in easily. While the butter cools down again, preheat the oven to 375F and prepare a loaf pan by spraying with non-stick spray and lining with parchment paper. Prep the apple by peeling it, quartering and coring it, and then slicing and cubing into ½ inch pieces. 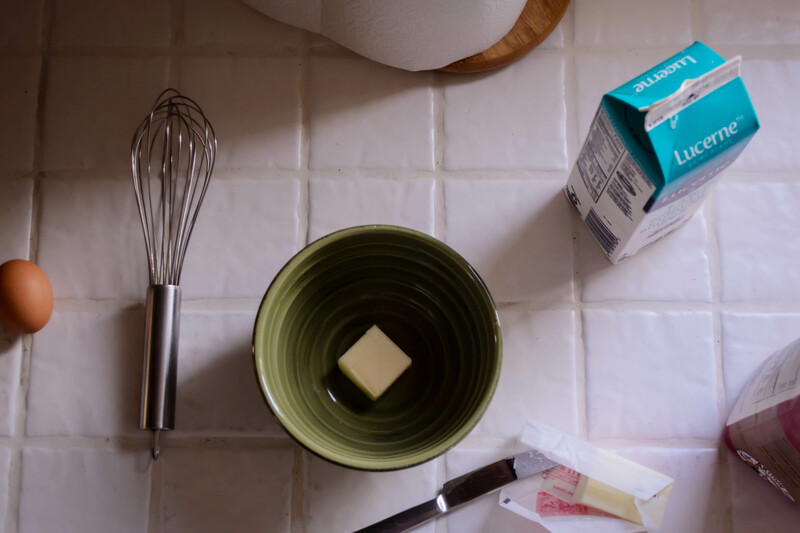 In a mixing bowl (Baking Illustrated recommends using a stand mixer, but I used a glass bowl and my regular electric mixer and it was fine), combine the re-solidified butter and all of the sugar. Mix at medium speed until very light and fluffy, at least 3-4 minutes. Really. That long. It will take on a texture much like a slightly grainy buttercream frosting. Beat the eggs with the egg yolks, the water, and the vanilla and, with the mixer still running, dribble in this egg mixture until all is well combined. At this point the batter will be very thick and glossy and still a bit reminiscent of frosting. Now, sift in ½ cup of the flour with the salt right over the top of the batter. Once it is all snow-drifted on top there, use a rubber spatula to fold it in. Once fully combined, repeat the sifting and folding with the second ½ cup of flour. Sprinkle the apple cubes over the batter, then dust with the remaining ½ cup flour. Giving the apple chunks a little flour coating helps them stay suspended in the batter during baking, rather than sinking to the bottom. Repeat the folding process one final time, being sure the flour is fully incorporated and there are no dry pockets. With your rubber spatula, pour and scrape the batter carefully into the prepared loaf pan. Smooth off the top if you like, then stow in the preheated oven for 45-55 minutes, or until a toothpick insertted comes out with just a few damp crumbs. Let the loaf cool in the pan on a wire rack for 5 minutes, then use a second wire rack placed over the top of the pan to invert. The loaf will plop right out, upside down, onto this second rack. Carefully remove the pan from the loaf and flip the loaf back over top-side-up to cool completely. Peel off the parchment paper, transfer to a cutting board, and slice up thickly to eat. 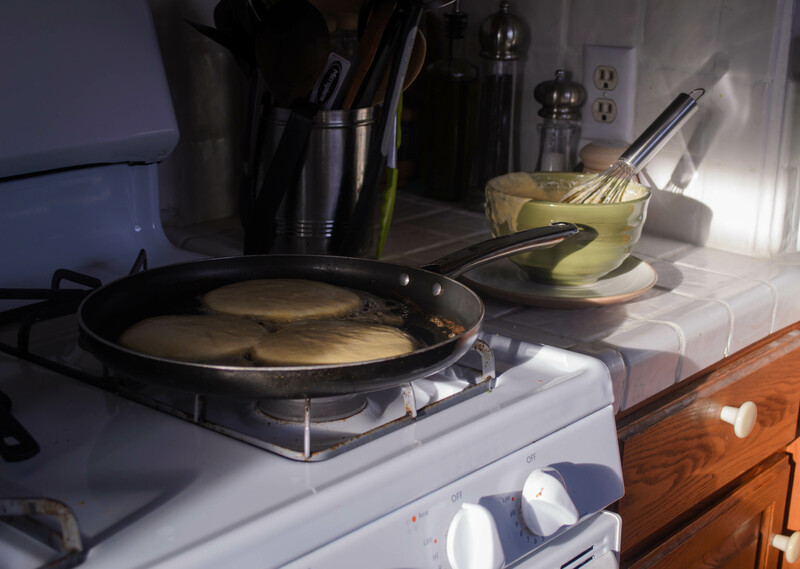 buttermilk pancakes in morning light.